We also do branding, but by request only! Made to order minimum orders x100 pairs upward. Find Secret messages in adverting or competiions! You've finally made time for a round of golf...... but your balls keep disappearing, getting anoid and your stocks are running low, sounds familiar?? 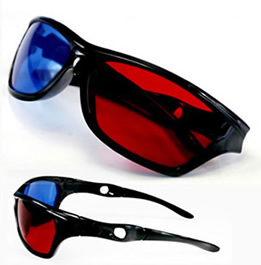 - Users save hours looking for their wayward golf balls with these specially tinted glasses. Aside from being a brilliant branding premium, these glasses actually serve a very useful purpose! 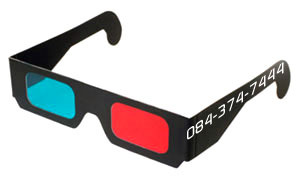 below explaines the 3 basic types of 3D commercially available today..
Mostly used in the printing industry, magazines, kids books etc, but is so veratile that it works on all digitallly projected media as well, including TV's. It's furthermore the only type which can be printed onto a flat surface & uses no electricity either (Passive). 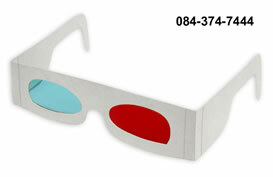 Its therefore the only one which is used in the print advertising field & requires red/cyan spex to view. Good lighting is essential for effective viewing. Mostly used in the movie industry,theatre's, Theme Parks etc, but is also found in home theatre's, 3D TV's & Gaming Stations as a limited range of projected media also supports this tecnology. It cannot be printed onto a flat surface & the spectacles dont rquire power either. (Passive). It requires polarised spex to view. Dimmed lighting is essential for effective viewing. 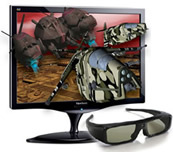 Mostly used in 3D TV & Gaming industry etc, but is also found in home theatre's & Gaming Stations as a limited range of projected media supports this tecnology. It cannot be printed onto a flat surface & the spectacles do require power. (Active). Dimmed lighting is essential for effective viewing. Own courier collections are also welcome. By prior arrangement only. We also do branding, by request only.